On the way back from our Remembrance Day outing, Kendra and I came across this bizarre trio of sculptures outside the British High Commission on Elgin Street. Our reactions were quite different. She thought they were cute while they made me feel more than a little uncomfortable. I can’t really describe it any better. I find it curious that the photo doesn’t creep me out nearly as much as being in their presence. Unfortunately, there was no sign listing the artist or info about the sculptures. The High Commission’s web site also has no information about them. 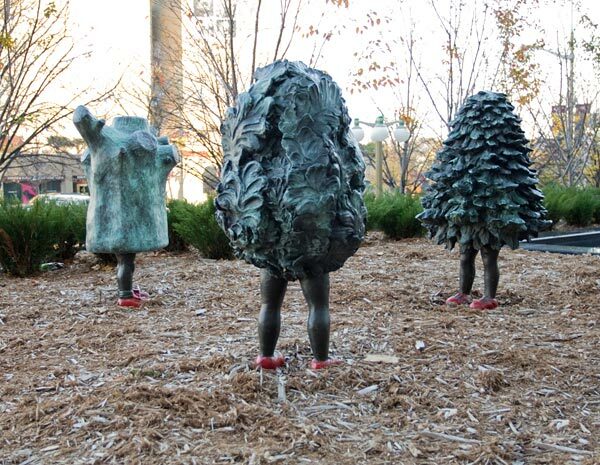 As Jessica pointed out in the comments, the sculptures are are by UK artist Laura Ford. The trio is called Nature Girls, and the individuals are Stump Girl, Bush Girl, and Conifer Girl. Jeez, I miss all the good stuff! Thanks for the info.